"41CE6-11, Burial Feature AN-2" by Timothy K. Perttula and Robert Z. Selden Jr.
DECORATION (INCLUDING MOTIF AND ELEMENTS WHEN APPARENT): The vessel rim has upper and lower rows of excised tick marks that either point downwards towards the vessel body or upwards towards the vessel lip. 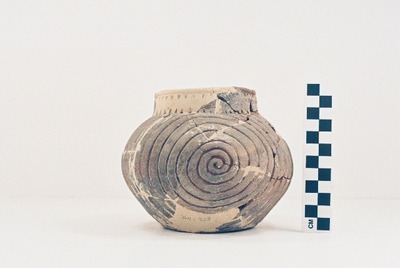 The vessel body has concentric hooked arm engraved spirals repeated twice around the vessel. Poynor Engraved, var. Freeman globular bowl from the E. W. Hackney site.